This time on `Up for the Cup` we feature our most successful manager of modern times--John Connolly. He first arrived at Palmerston from Tyneside in 2000 and in the four years he was with us we won promotion to Division One and only six months later lifted the Challenge Cup. 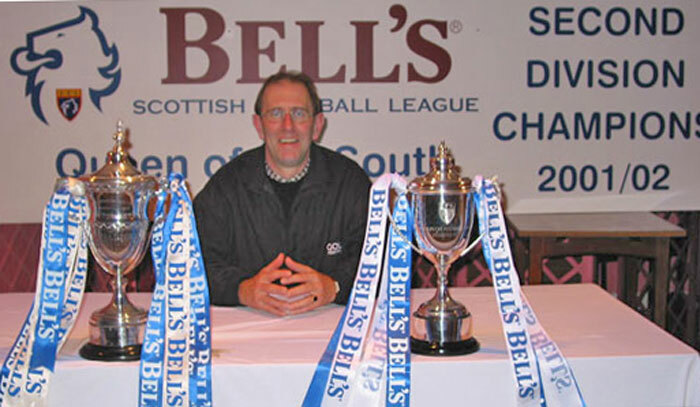 He insists "The four years I spent at Queens will always be a happy memory for me and my wife Anne and if only I had the benefit of hindsight, I would never have left the club, as we both loved living in Dumfries and still have many friends in the area. "When I took over as Manager the club had just escaped being relegated to the third division due to Hamilton having a massive points deduction incurred, which effectively got them relegated and gave Queens a reprieve. "The squad I inherited had to be totally revamped to give us any chance of staying in the second division and then the target was to try and develop the club from youth level through to the first team. 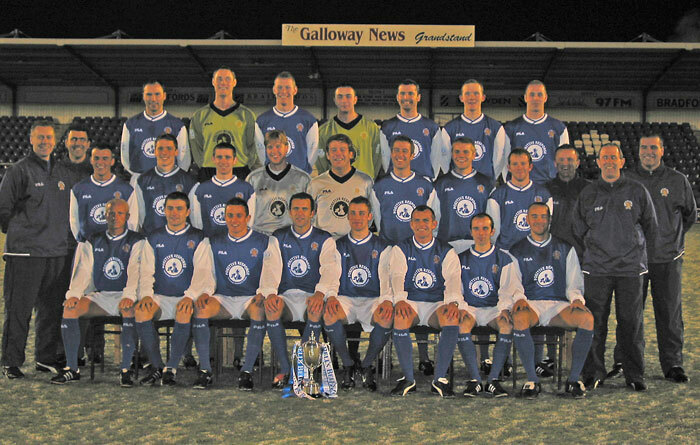 With a long term strategy put in place that would see stability in all areas of football development for the future and I believe when I left the club at the end of season 2004 it was recognized by the majority of people in football as an established First Division SFL League Club. "I also believe the year we were top of the First Division for five weeks on the trot, if we hadn`t lost three of our most influential players--Colin Scott, Jim Thomson and big Sean O`Connor at a vital time in the season, we could have went on and won the league. "I have to say the development of the club happened even quicker than I thought it would with a first League Championship win in 50 years and the club`s first ever major trophy with the Challenge Cup win. Bear in mind all the players were part-time which made it a remarkable achievement for all concerned. "One of my signings at the start of the season was THE GOALIE – Andy Goram. A few eyebrows were raised when we signed Andy as his reputation preceded him, but I can assure all the Queens supporters he was a great signing and even though he was coming into a part-time environment he was always at training, trained well and worked well with our other keepers. I`m sure Gordon Doig our goalkeeping coach enjoyed every minute on the training pitch with him. Even though he`d won nearly everything in the Scottish game with Rangers, nobody enjoyed the Challenge Cup Final win more than Andy himself. "That cup run was fantastic! Starting off with a difficult tie up in the north-east against a strong Peterhead side we produced a solid performance to run out worthy winners 2-0 and looked forward to the next round at home to Morton. "We won a tight game at Palmerston against the Cappielow side 1-0 and followed that up with another home win, 2-0 against Dumbarton in the third round, to take us into the semi final where we would meet St Mirren at Love Street. "We hadn`t lost a goal leading up to the St Mirren game but everything changed in this match which turned out to be a high scoring 5-3 thriller. It may have been exciting for the fans, but it is hard to describe the mixture of emotions you go through in a match like this in the dugout. We were ahead three times only to be pegged back each time by Saints until we finally scored two late goals to take us through into the final at Broadwood. "The one moment I remember totally in the game was when we were under the cosh as St Mirren pushed everybody forward late in the match to try and get a fourth goal to level it up at 4-4. They had a corner on the right hand side and we were trying to get a defender on to help us defend that corner and the linesman wouldn`t let us put him on until we handed him a piece of paper with the subs name on it. I have to confess I blew a gasket with the official but thankfully things worked out okay when Paul Shields netted in injury time to put us into the final. "Robbie Nielson joined us on loan from Hearts and played his first game in the semi. He was outstanding and a terrific player for us for the rest of the season. "The final itself was a great day for everybody involved at the club from tea lady, cleaners, kit man, PR man, ground staff, directors, players, coaching staff, volunteers and above all the fans themselves. The 2-0 result on the day I felt was fully merited as we ran out comfortable winners against a stuffy and competitive Brechin City side. 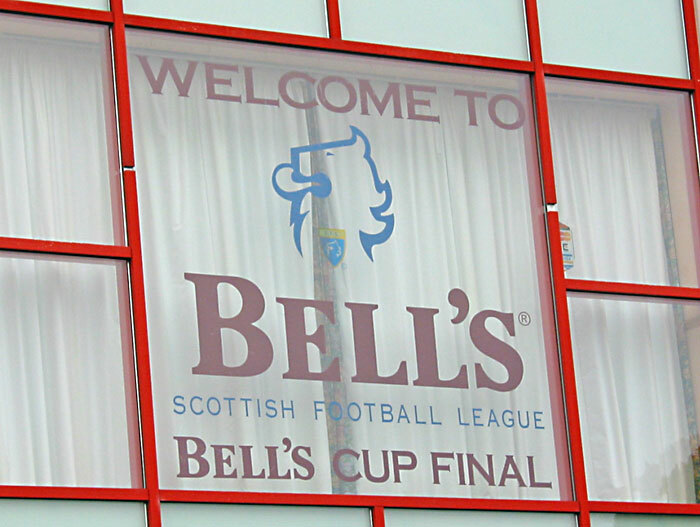 "The first I remember was a bit controversial because Brechin had disputed John O`Neill`s goal, claiming the ball hadn`t crossed the line, but I was delighted when the referee awarded the goal and really pleased when Derek Lyle scored with a great header from a Joe McAlpine cross in the second half. That won the game for us and brought Queens their first national trophy back to Palmerston for the fans." The team that day was Goram, Neilson, Anderson, Thomson, Aitken, O`Neill, McColligan, Bowey, Weatherson, Lyle and McAlpine. Subs were Scott, McLaughlin, Paton, O`Connor and Atkinson. "Everybody involved at the club during that time should be really proud of their achievements as all the players and staff were part-time, competing against full time clubs. I would also like to thank the staff who worked with me during my time as manager--I could not have done it without them! "Finally, I would like to thank all the Queens` fans for their terrific support during my time at the club and wish you all the best in this season`s Challenge Cup Final and for many years to come."